Once TC develops a relationship and a level of trust in your operation and your safety you may be granted a Standing Special Flight Operations Certificate (Standing S.F.O.C.). At DroneBoy we have one of these in place for each of the five flight regions in Canada. 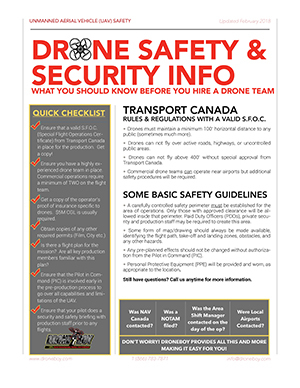 This is our companies commercial flight certificate issued by Transport Canada (TC) and it applies to all our drones and all our certified pilots. What that means is that as long as we keep our operations within the 82 individual requirements of our specific flight permit then we can fly anywhere, any time in Canada. Some of the big restrictions on our permit include things like keeping flights below 400’, staying 100’ horizontal separation from the public, never flying over the public or active roads and staying out of class F restricted airspace (like Niagara Falls) without further approvals. One of the things that folks sometimes have a hard time wrapping their heads around is the 100’ horizontal separation part. It has nothing to do with how high the drone is. 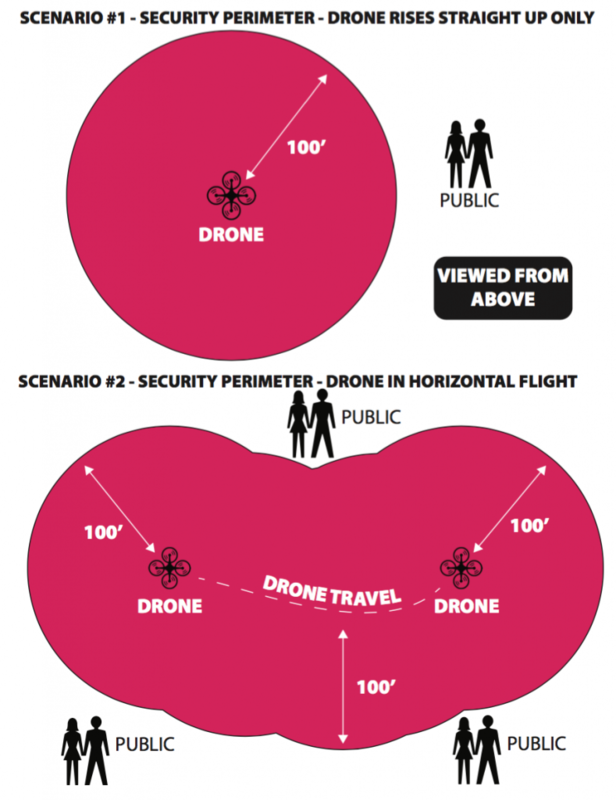 We could be flying at 4’ or 400’ – we still must always stay 100’ horizontally from the public. We have created this little infographic to help explain it. Many of the things that we are limited from doing we can make a special application to TC and get a one-time approval for. We have successfully obtained one-time approvals for flying up to 700’ (Molson – Anything For Hockey) and many times to fly Niagara Falls. These special permissions can take some time. Usually up to a month but we have seen them come through much quicker too. One thing to keep in mind when working with drones for commercial use – always get a copy of your drone operator’s S.F.O.C. and their insurance. We have put together this little pdf explaining some of the other stuff clients should be looking for in their drone operators. If you still have questions contact visit the Transport Canada web site or contact our office anytime for more information.